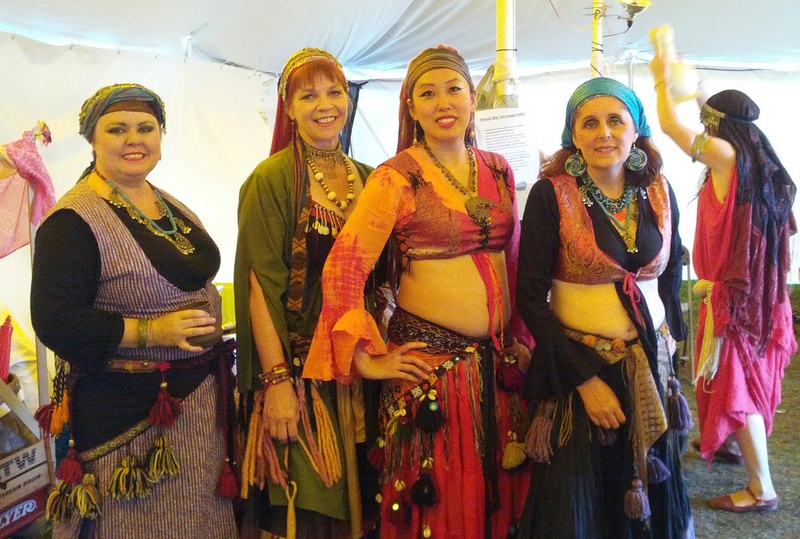 At our Spring Hafla in Fredericksburg I gave a mini-lesson in the fan veil combinations. There wasn’t a lot of room but we all enjoyed a bit of follow-the-leader fun together. It’s a plus that the combos are so easy to pick up – that is, they’re easy to do if you’re big enough to actually use them! Are children’s fan veils a thing? Because kids sure do love playing with floating fabric. We’re enjoying the Fan Veil “game” a lot – more to come in the next shows as well! Yes, it’s been a rough start to 2016 with a serious knee injury followed by the flu. I’m dancing again, gingerly because my knee isn’t quite right, but it’ll do. Coming up this weekend is the first public performance of the year! Tribal Odyssey is gentle enough that I feel confident enough to dance, and I’m looking forward to it. 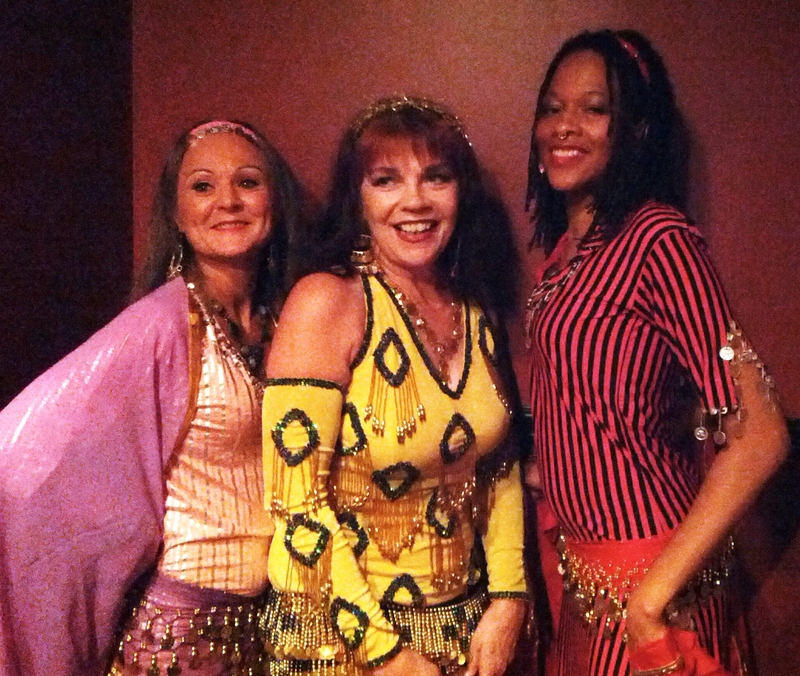 Saturday in Fredericksburg I’m doing a 50-minute interactive presentation on bellydance for a local women’s event, along with some of my dancers. So at the end of this mini-class we’ll do a short dance demo featuring some TOBD. We’ll use “Love Signs” for slow moves, arms, and Fan Veils; followed by “Come Dance with Me” for fast combinations with finger cymbals, ending with audience participation. That gives us an exciting and diverse 10-minute demo that includes getting the class participants dancing too! Fan Veils, with finger cymbal pouches at the ready! Have a seat, and dance! So I’m injured at the moment, but dance class is tonight and I’m excited! It’s the new year, first class, and I can’t wait to get back after two weeks off. Since I can’t dance until my knee is fully healed, I plan on teaching a bit of a sit-down class tonight – yes, my student are going to be sitting in chairs for part of the class! Not for them to study and take notes, but to go over upper body movements, arm and hand cues, etc. *while facing front, then in circle, then duets. Since I also teach Oriental Raks Sharki, we’ll go over upper body combinations from our current choreographies as well. So that’s my plan to keep things ticking while I have to sit this out! If you have other questions or ideas on teaching while injured leave me a message in the comments. Step Right, step Left, repeat. Here’s a quick video clip on the “Flare-kick” skirt combination from the Tribal Skirt online course. The full tutorial goes into more detail but this should be enough to get the gist of the 16-count sequence. Teaching this particular skirt combo is always an adventure. With only two steps in 8 counts, that leaves 6 whole counts where students are going, “huh? !” Of course, ANY combination that includes facing away from the instructor is a challenge in class because students continuously try to “check in” while dancing – which is why I often sit down and watch. At some point you have to cut the cord and see what happens! So here it is for you to try on your own – can you get it? Have you ever noticed that sometimes the simplest combos are the trickiest? tribal – now with fan veils! Tribal Fan Veils are EASY! Who knew? It’s funny that it took over a year for me to try it – maybe two years – after Pixie Fae’s original suggestion. I thought it would be difficult to create group improv for fan veils, so kept putting it off when she’d periodically bring it up. Well, one day this past September I invited her over, and came up with about 8 combinations right off the bat! I shared them at our performance group rehearsals, and also in class – the students all love seeing all the beautiful fan veils in the mirror – it’s such a treat. So after a couple of months now of using them in class and rehearsals, it’s all coming together. I’ve got about ten short combinations of 8 counts each, and when we dance them together it helps get all the details sorted out for turns, traveling, changing leaders, different formations, etc. It’s really fun! My performing group PRISM Dancers felt so confident that we performed them in October, at an outside festival in Fredericksburg. In fact, Fairy Fest may have been part of my inspiration for finally tackling these combos. 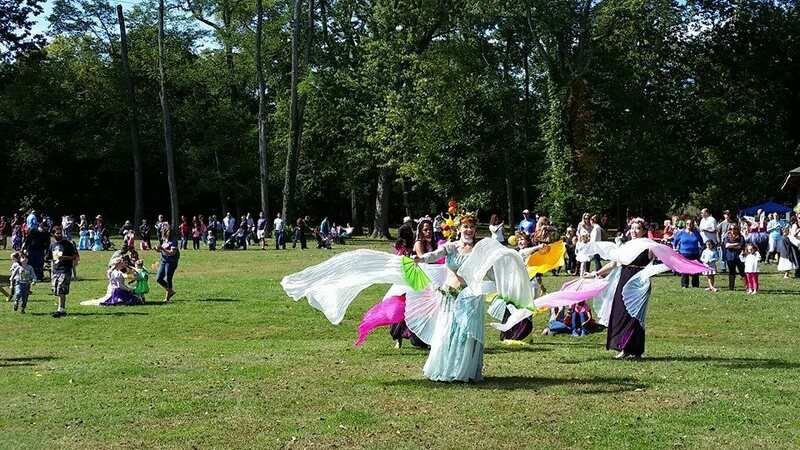 Fan Veils just seemed perfect for a Fairy Festival! But there was no lead-changing that day, it was too soon, and in the wind we could only face one direction. Yes, it was a challenge, but we kept the wind at our backs, and it worked! Some of my PRISM Dancers and I did a bit of TOBD in our show at the local multicultural fair yesterday. We used Sirocco’s “Intro” track because it fit in so well with the rural Egyptian music we used for our folkloric choreographies. And of course playing the finger cymbals fits right in too. I was happy to see my hip moves coming back, I’ve been working on getting them big and clear enough; so I was happy to see this little video, courtesy of Siyala’s family. We’re all in beledi dresses: no costume changes because it was a short 30-minute show. 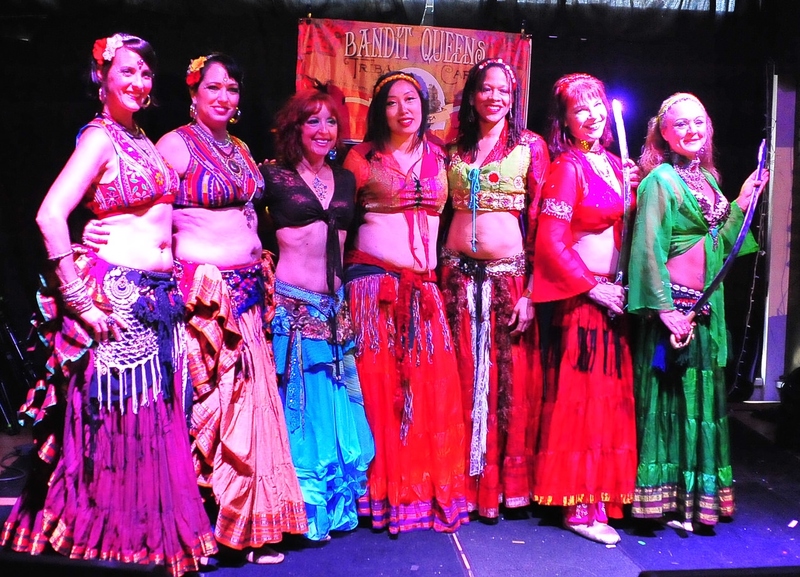 This also demonstrates how well Tribal Odyssey synchronized improv fits into a show that includes other styles of belly dancing. We began with this TOBD number, then went right into Ghawazee, Raks Assaya; American Oriental; slow TOBD and Tribal Sword; American Belly Dance again; then Interpretive (a fun basket dance). The dresses are a compromise between glitzy and folky – we all stayed onstage through the entire show. So convenient!